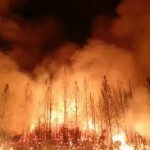 The fire began late Sunday night near the intersection of Pfeiffer Ridge Road and Highway 1, close to the Big Sur Lodge. Its cause remains under investigation. By Tuesday morning, about 625 firefighters had arrived to fight the blaze. In addition to destroying the homes of Big Sur Fire Chief Martha Karstens and 14 others, the wildfire has forced the evacuation of about 100 people near Highway 1. Fire crews have achieved little, if any containment, but remain optimistic that cooling temperatures will impede the spread of the wire as the week progresses. heartbreaking for those who lost homes and the burning of the precious , beautiful area.